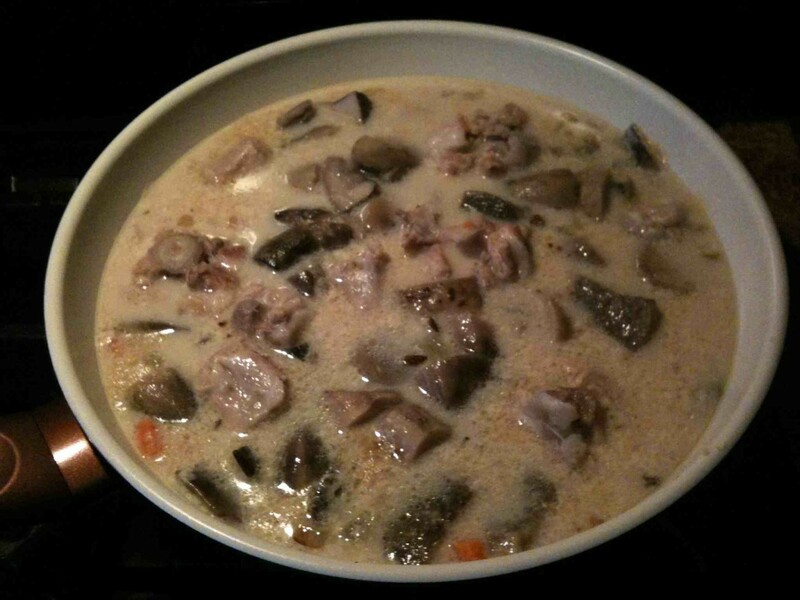 I use Cream of Mushroom Soup for the base of many recipes. In the past, my early married life, I usually just opened a can of condensed soup. It was what I saw my mother do and I never dreamed about making it from scratch. If I only knew back then how easy it is to make this soup. In addition, the taste is far better than anything out of a can. I use this soup not only as a base, but also as an appetizer or meal also. They key to this warm, comforting soup is fresh ingredients and love. The time is about 10 minutes more than opening a can; it is well worth the extra 10 minutes. In a large heavy bottom skillet, drizzle a small amount of olive oil and add butter. Turn stove on to medium low. Dice onions and add them to skillet. Stir occassionally until soft and translucent. 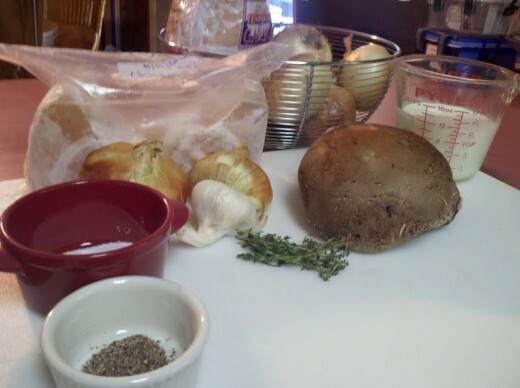 While onions are softening, clean, stem and dice mushrooms into 1/2 cubes. Add to skillet when finished. If needed, drizzle a little more olive oil over the top to make sure they will not dry out. Stir. Let simmer for five minutes. Stir again. Cook for another five minutes or until the mushrooms are soft. Add 2 tablespoons flour and about 1/4 cup of stock. Stir until it is all worked in. If desired, add your roasted garlic chopped very fine into the pan at this time. Add milk and the rest of the stock. 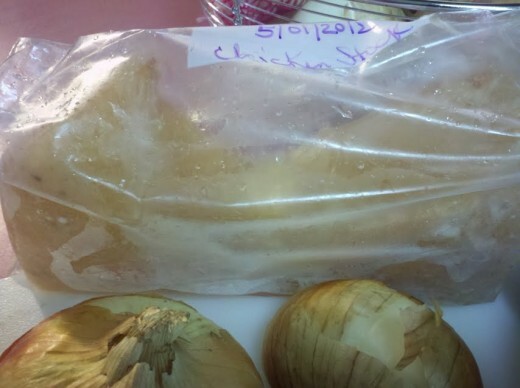 I make my own vegtable and chicken stock and freeze it to use later on in freezer zip bags. I usually freeze 2 cups in each bag and just pull it out when I am assembling my ingredients. To thaw: either run the bag under warm water. You may also remove stock ice from bag and place in a glass bowl and microwave. 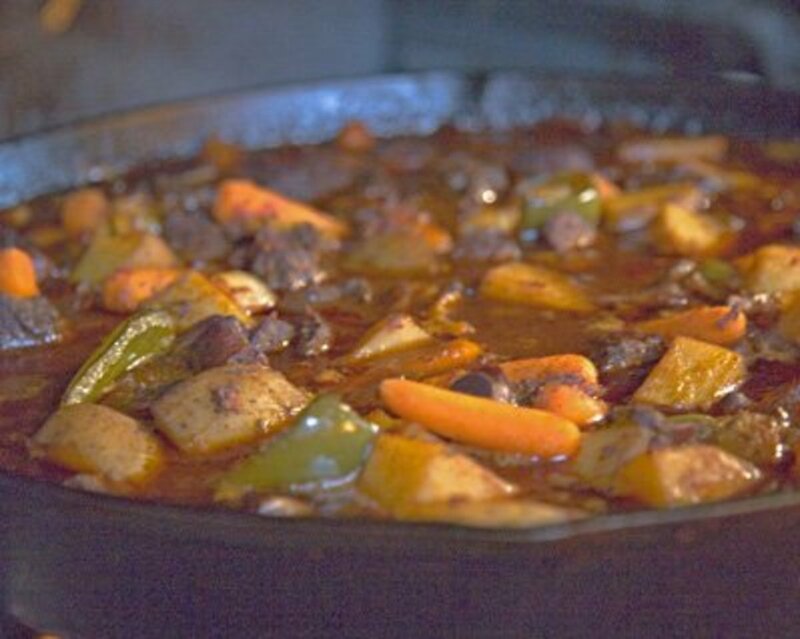 **Using a boxed stock is perfectly acceptable for this recipe also. Preparing mushrooms is not hard. First, mushrooms should be cleaned -- but not washed. Water over the mushrooms will make them slimy. 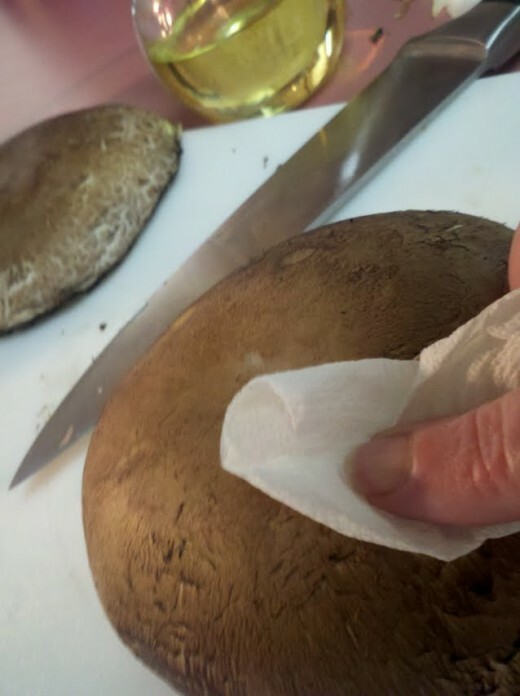 To clean a mushroom, take a dry paper towel and rub them over the top. The mushrooms stems are many times tough and woody in texture. The only time I use them in cooking is to make a stock or inside of a stuffing diced very small. Most of the time, I will take the stems and put them in a freezer zip bag, keep them in the freezer until it is time to make stock. 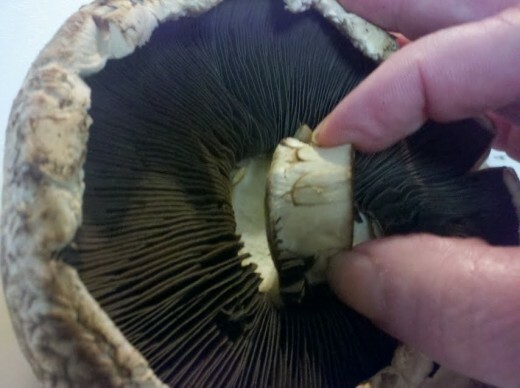 Mushrooms add a woodsy flavor to your food. They also add protein. Enjoy some bread with your soup! A good bowl of soup is best enjoyed with a hearty and crusty bread. A fellow Hubster friend of mine has a bread recipe that would be very good with this. Her bread is made with whey. What a unique concept... I always wondered what to do with that extra whey. I would slice a couple of peices of the whey bread and toast it. What would even put the bread over the top is a little butter and roasted garlic. Yum! In a few weeks, other bread recipes will be added also... so check back with this page. Bake in a covered oven proof dish for 30 minutes at 400 degrees. 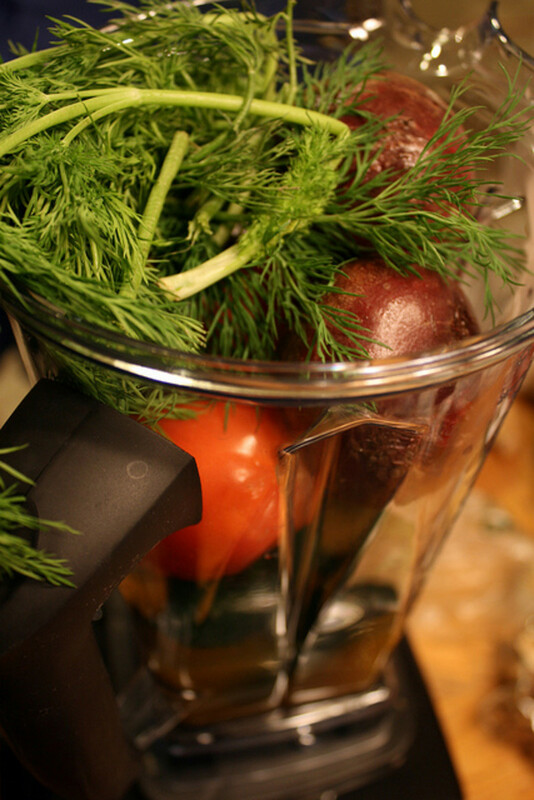 Roasted galic is good to add to soups, use as a spread and make compound butter with. You can also add to other recipes. 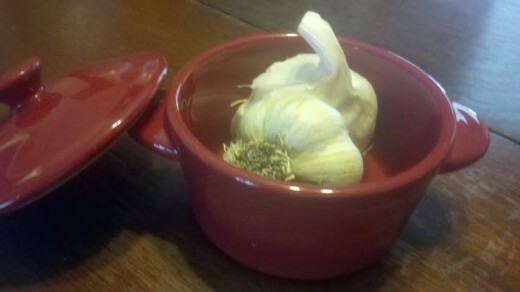 Heck, for the real garlic lover, you can just eat it from the bulb. Keep refrigerated after roasting. Use within a week. Loos so delicious. Sure will try this recipe. Thanks for sharing it. Voted up! Please feel free! I'll link to this recipe too, if you don't mind, because I mentioned how yummy that bread is with soup. Thanks for this recipe! The soup looks delicious and your pictures are great. 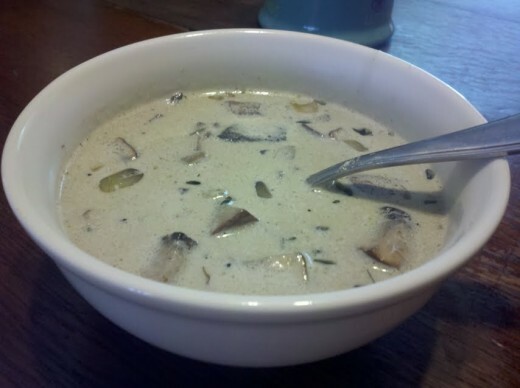 I eat soup throughout the year and am particularly fond of mushrooms, so I'll have to try this one out. I love to make homemade bread to go with my soup—in fact I just put up a recipe for a whey and wheat bread that I think would go great with this soup ... especially on a cold fall evening. Yum!